A girl named Tara* was adopted at 13 months from a Mumbai based adoption agency. She grew up knowing her status, regularly visited the adoption agency and celebrated her birthdays with social workers from the agency. The word ‘adoption’ was part of her growing up years which was perceived as normal. Now at the age of 9 years, she has begun to understand the actual meaning of adoption and the concept of two mothers and felt comfortable sharing it with her class teacher and classmates. To her surprise her classmates did not understand what adoption is and why Tara has two mothers. Facing this dilemma, Tara discussed it with her mother, who approached the class teacher to make the students aware of this concept so that Tara feels normal while talking about it. The class teacher while understanding the importance of the situation, did not feel equipped to talk about this issue and asked the mother to approach the counsellor. The counsellor is looking for an effective way to talk about this topic to the class and in the meantime, Tara’s parents have instructed Tara not to discuss her adoption status with her classmates. This has left Tara confused and with a constant complaint that she doesn’t have friends. This story raises a few pertinent questions: Were Tara’s parents right in asking her not to talk about her adoption status? What could Tara’s class teacher have done in this situation? Is it only the responsibility of the teacher to deal with the topic of adoption in class? How does an adopted child feel when others are not able to relate to what he/she says about adoption? 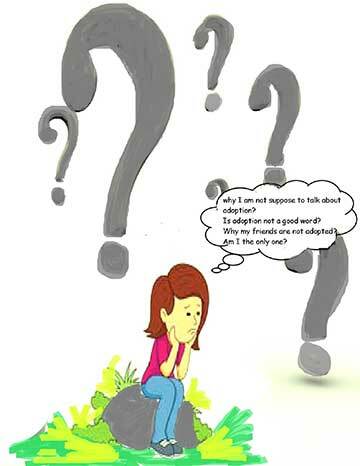 Now what are Tara’s feelings about adoption when she has been asked to stop talking about it? What does the story indicate about the society we live in? Children may be able to tell the story of their adoption, but it is not until they reach school and develop more complex thought processes that they become aware of what adoption really means (Messe, 2012). In the families where adoption is shared, the question is whether the adopted child is free to share his/her adoption story with others. There may be many children like Tara, who may be comfortable with the fact of adoption due to the efforts made by their parents but when they try to find the same comfort with their friends or class teacher, they might face confusion, stress, and disappointments and feel discouraged. This may be due to the fact that friends or teachers may not have the knowledge or the understanding of how to respond to adoption which may lead to differential or insensitive treatment to an adopted child, the fear from which most adoptive parents suffer. Considering the situation, it becomes necessary for schools as well as teachers to acknowledge that children in their classrooms come from different family forms including adoptive families that exist as part of normal parenting structure. Every workshop that is conducted at school on child behaviour, developmental or academic issues should discuss the topic of adoption. Teachers could be trained to be sensitive when guiding classroom discussions and make children aware that conflicting emotions are normal for everyone (Messe, 2010). The aim should be to make ‘adoption’ a part of a normal conversation where the child can discuss his/her adoptive status without any apprehension, feel valued regardless of how their family was formed and is encouraged to ask curious questions. Acknowledging and talking about adoption is not a one-time approach; it’s a gradual journey of every adoptive family and in this journey, the schools can provide a facilitative platform. The schools’ initiative to acknowledge adoption in the classrooms can be a beginning for every adoptive family to share their journey of adoption without the fear of being judged or misunderstood. Ultimately, it is the story of the child and it is up to the child with whom to share the story. We, as adults and educators, need to create an empathic context to understand the story and its central character – the child. The author is a PhD scholar at the Tata Institute of Social Sciences, Mumbai, a child psychologist and an Erasmus fellow. She can be reached at sahana.mitra2012@tiss.edu.